The appearance of floaters and flashes of light in your vision may be alarming, especially if they develop very suddenly. As we grow older, it is more common to experience floaters and flashes as the vitreous (the clear gelatinous fluid that fills the inside of your eye) becomes more liquefied. As it loses its structure, it gradually pulls away from the inside surface of the eye. When this occurs acutely it is called a posterior vitreous detachment. You should see your optometrist for an urgent examination if you notice flashes or floaters, as not all cases of these symptoms are caused by innocuous age-related changes. Small specks or clouds moving in your field of vision are called floaters. You can often see them when looking at a plain background, like a blank wall or blue sky. Floaters are actually tiny clumps of cells or material inside the vitreous, so while these objects look like they are in front of your eye, they are actually floating inside it. What you see are the shadows they cast on the retina (the layer of cells lining the back of the eye that senses light and allows you to see). Floaters can appear as different shapes such as little dots, circles, lines, clouds or cobwebs. When the vitreous gel pulls on the retina, you may see what looks like flashing lights or lightning streaks. These are called flashes. You may have experienced the same sensation if you have ever been hit in the eye and seen ‘stars.’ The flashes of light can appear off and on for several weeks or months. Are floaters or flashes a concern? For most patients, the appearance of floaters and flashes is a sign of a posterior vitreous detachment. As we grow older the vitreous (the clear gelatinous fluid that fills the inside of your eye) changes and becomes more liquefied. As it loses its structure, it gradually pulls away from the inside surface of the eye. When this occurs acutely it is called a posterior vitreous detachment. This is a normal part of the eyes getting older. There is generally no treatment required for a posteior vitreous detachment. With time the floaters will settle due to gravity and the brain will adapt to seeing the drifting shapes as they are always present. When an optometrist examines your eyes for floaters or flashes, they may dilate your pupils with eye drops. During this examination, your optometrist will carefully observe areas of your eye, including the retina and vitreous. If your eyes have been dilated, you may need to make arrangements for someone to drive you home afterward as your vision may be blurry for 4-6 hours afterwards and you will be light-sensitive. Some people experience flashes of light that appear as jagged lines or ‘heat waves’ in both eyes, often lasting 10 to 20 minutes. These are not flashes from the vitreous gel pulling on the retina; instead, these types of flashes are usually caused by a spasm of blood vessels in the brain, called a migraine. If a headache follows the flashes, it is called a migraine headache. However, jagged lines or heat waves can occur without a headache. In this case, the light flashes are called an ophthalmic migraine, or migraine without headache. Contact your optometrist if you experience these symptoms. 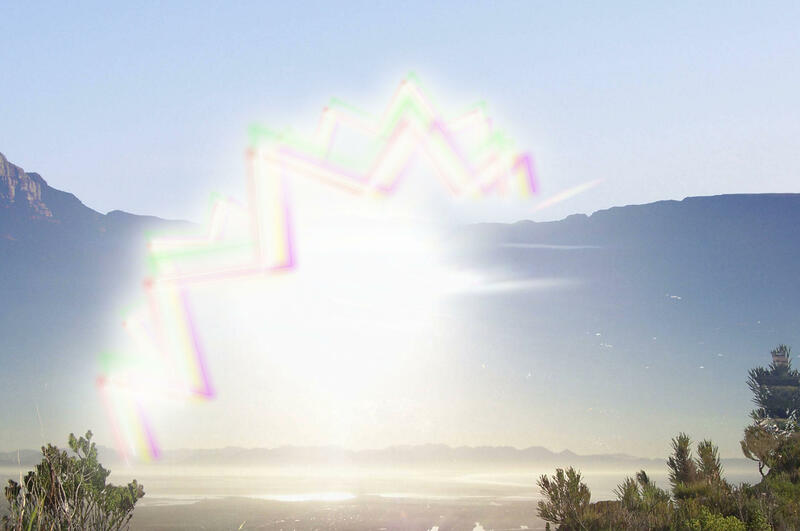 CAPTION: An artist’s depiction of how a migraine aura appears.